For all its ever burgeoning population and high cost of living, I think California still offers a lot of good living away from the crowds in small towns hugging its pristine coast, offering the surf swish of blue Pacific ocean, cradling mountains that often walk down to the sea like in Big Sur country and, of course, the soothing warmth of year-round sunny days with low humidity. To me, California is like going into one of those specialty ice cream outlets and finding yourself overwhelmed by a dazzling array of choices. I just love the place! Pacific Grove, however, stands out for me, located on the Monterey peninsula not far from ritzy Pebble Beach, rugged Big Sur, and charming Carmel-by-the Sea. This area, in particular, means a lot to me, for Karen and I spent fun honeymoon days taking in its varied tapestry twenty years ago. I’m all about regaining paradise. Pacific Grove wasn’t even on my radar map until several weeks ago when I happened to find it mentioned in a book off my shelf that I hadn’t read in over two decades and started reading again. While noting the town is famous for its annual influx of migrating Monarch butterflies each November, the writer laments their declining numbers, probably due to a shrinking habitat as housing construction continues to expand. I would add the increasing loss of milkweed, a principal food supply for the larvae. Now this was way back in 1990 and thus my curiosity was aroused as to the plight of the Monarchs since, and so I did the research and came up both buckets full with info on Pacific Grove and its wintering Monarchs. The news is good, though it could be better. After more than twenty years, they still come to escape the winter cold of the Canadian Rockies and Southern Alaska, though in sharply diminished numbers, perhaps about 10,000, unlike the 50,000 plus in the halcyon days long gone. The town seems attentive to its friends, even staging an annual parade (October), and why not, since they’ve built a thriving tourist industry around them and any further decline means diminished dollar intake as well. There is a fine of $1000 for molesting a butterfly. Well-meaning, but on occasion, the city council can be dimwitted, opting in 2009 to prune the eucalyptus trees that the monarchs favor in their designated Monarch Grove Sanctuary, resulting in a precipitous drop shortly after to less than a thousand Monarchs. Cutting a branch is like tearing down a house replete with its residents, since the larvae cocoon on these bare branches. 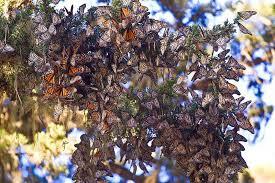 Today you’re likely to see more Monarchs further down the coast toward Santa Cruz. Some recent visitors report seeing just a couple of trees with butterflies, vastly changed from the swarms that blanketed the eucalyptus several decades ago. What appalls is the council’s acting against the advice of environmental scientists. Then, in November 2012, the council was forced to make public its plan to revamp the Sanctuary, strikingly out of touch with California’s environmental recommendations. In the past, the council has a history of foregoing environmental reviews. As I write, I don’t know the outcome. But I do need to be fair. It used to be that the the principal Monarch habitat lay in the city’s George Washington Park, but urbanization, foot traffic and drought have taken their toll. The city is trying to restore the habitat through tree planting, mulching and new trails. The numbers are down to less than a hundred now. 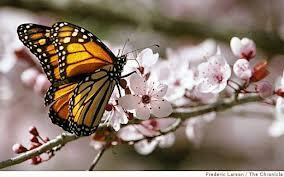 The Monarchs are awesome in their intricacy of evolved pattern, suggesting aerial tigers. They’re also, though infinitely delicate, intrepid pilgrims on their own hajj to a nesting place they’ve never been, and yet they somehow find their way in a journey consummating up to 2000 miles. Central California is Steinbeck country and the Nobel laureate made Pacific Grove his home with his first wife, Carol, and visited it often in his later years as his own sanctuary providing renewal. He would later tellingly write that “Pacific Grove benefits by one of those happy accidents of nature that gladden the heart, excite the imagination, and instruct the young” (Sweet Thursday). I suspect the Monarchs had a great deal to do with that. This entry was posted in Environment, Lifestyle, Reflections and tagged Big Sur, California, Monarch butterflies, Monterey, Monterey Peninsula, Pacific Grove, Pacific Grove Monarch Sanctuary, Steinbeck, Sweet Thursday. Bookmark the permalink. Put the cotton on your eyelids and keep for 20 minutes.